Certified Nursing Assistants work under the supervision of a nurse to help the residents in hospitals and long term care facilities. Their responsibilities include bathing, grooming, and dressing patients, providing for their nutritional needs and ensuring their general comfort and safety. The Indiana State Department of Health (ISDH) governs the activities of nurse assistants in the state. Their requirements for training and testing ensure nurse assistants have the knowledge, skills, and abilities to fulfill their duties on the job. 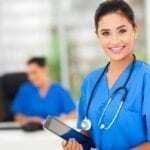 A CNA career provides a great stepping stone for individuals who want to pursue a career in nursing or other professions in the healthcare industry. Licensed professionals with over 30 combined years of nursing are the lead instructors in the Certified Nurse Aide training program at the Healthcare Training Center. The program is presented in partnership with Indiana University and Workforce Development. New classes begin every month. Daytime students complete the training in four weeks while evening students require 5 weeks to complete the course. Students do not need a high school diploma or GED to enroll. However, the school has strict requirements that students must meet before commencing the clinical training. They must present a 2 step TB test or Chest X-ray, the results of a physical exam listing any limitations and a criminal background check from the County of State Police by Day 8 of classes. Students must deposit $100 to reserve a seat in the training. Free tuition is available for qualifying students. Students who do not qualify for free tuition can apply for reimbursement of the full cost of training (tuition, course materials, and textbooks) after obtaining employment from a Medicaid-funded facility. The Healthcare Training Center provides job placement assistance to all students. 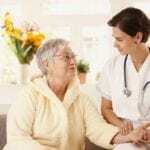 The nurse assistant training at In Training College comprises of 36 hours of classroom training and 80 hours of clinical training at a state approved long term care facility. At the end of training, students will have the basic skills needed to care for residents in hospitals and long term care facilities. Applicants must be 17 years or older and pass a criminal background check, pre-entrance exam comprising of basic Math and English, and a two-step TB test. New day classes begin every month; there are two weekend classes for the year. Students must acquire uniform, shoes, and a watch with a second hand for the clinical experience. The school requires a $100 to reserve a spot in the class. The course fee includes tuition, lab fee, books, and the state exam fee. Training is free for students who qualify for Workforce vouchers. Blue Skies Hospice facilitates a 105-hour nurse assistant training program that is accredited by the Indiana State Department of Health. Qualified instructors prepare students for the state exam through 30 hours of training in the classroom and 75 hours of hands-on clinical at an approved long term care facility. Both the classroom and clinical training equip students with the skills and knowledge to function as effective members of a healthcare team. They learn to assist residents with personal care tasks such as nutrition, grooming, and mobility. They also learn how to meet residents’ spiritual and psychosocial needs and ensure their safety. In accordance with state requirements, the school requires students to take a TB test, physical exam and criminal background check. Class size is limited to 12 persons to ensure personalized attention; applicants must deposit $50 to hold a spot. The $850 tuition must be paid in full prior to the commencement of class. Med Ed, Inc nurse assistant training comprises of one week in the classroom and two weeks at a clinical site. Students meet from Monday through Friday from 8:30 am to 4:30 pm. The supervised clinical training takes place at a local, long term care facility. Students must provide the results of a 2-step TB test and Work One vouchers by the first week of classes. The tuition is $900 and includes books, supplies, criminal history check, and the state exam fee. The expenses for uniform, shoes, stethoscope, blood pressure cuff, and other supplies are the student’s responsibility. The 4-week nurse assistant training program at Tender Love CNA Academy prepares students for employment in nursing homes, hospitals and home health care agencies. The program comprises of classroom and supervised clinical training at an approved long term care facility. The course curriculum includes topics such as the role of the nursing assistant, patient hygiene, law and ethics, patient rights, nutrition, and communication. Students also learn safety and emergency procedures, patient mobility, rehabilitation and restorative procedures, vital signs, observation and reporting, death and dying. Applicants must pass a criminal background check and TB test. Students qualify for discounts on tuition with early registration.